Eczema is a chronic, non-contagious inflammation of the skin characterized by itchy, red blotches and open lesions that ooze or bleed and become encrusted, causing a scaly appearance. Eczema causes are unknown, but a growing body of evidence suggests that eczema is caused by a genetic defect in the outer layer of skin (epidermis) that allows environmental irritants, allergens and microbes (microscopic, disease-causing organisms) to penetrate and inflame the skin. Not all itchy rashes are atopic dermatitis or even allergic reactions. 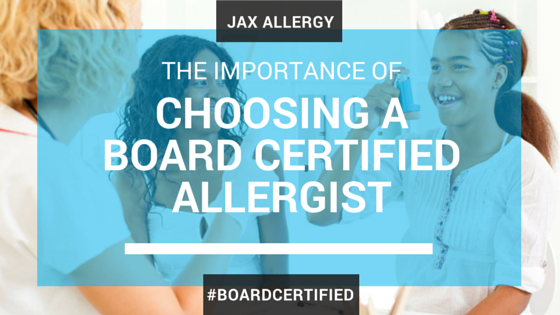 Be sure to consult with a dermatologist to see if an allergy consultation is the right for you. Seborrhoeic Dermatitis (also known as “cradle cap”), which causes a dry or greasy peeling of the scalp, face and eyebrows and is common among infants. Diagnosis of atopic dermatitis is typically clinical. Allergy testing may be used to identify potential triggers. Allergy patch testing may help with the diagnosis of contact dermatitis. Allergy & Asthma Specialists of North Florida have extensive testing to help identify specific triggers such as preservatives, additives, fragrances and other substances at home or in the workplace that may predispose a patient to allergic skin disease. Avoidance of known triggers of asthma is mainstay of treatment for eczema. Keeping the skin moisturized is essential as well. There are multiple types of eczema treatments and your allergist will develop an eczema treatment plan based on the type and severity of eczema you have, your age and overall health status. Eczema treatment typically includes both medications and lifestyle changes to help you avoid eczema triggers. Your allergist may prescribe a corticosteroid cream to decrease inflammation, plus an oral antihistamine to relieve severe itching. A short course of oral corticosteroids, topical immunosuppressant drug (calcineurin inhibitors) or antibiotic may be prescribed to control an acute eczema outbreak. If you have eczema, Allergy & Asthma Specialists of North Florida can help you stop the incessant itch and clear that embarrassing rash appearance. Don’t suffer eczema another day. Call for an appointment at one of our four convenient Jacksonville, FL locations on St John’s Bluff, the Westside, in Mandarin or in Orange Park in neighboring Clay County, FL.